One of our favorite items! These beautiful 4" ceramic coasters with "antique" style fly images will dress up your home while protecting your furniture from messy drips. 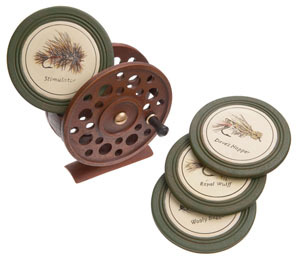 This set also includes a handsome "fly reel" holder to store and display your coasters.